The far-eastern healing art of Ayurveda traditionally originates from the Indian sub-continent. The southern Indian state of Kerala and the island of Sri Lanka are considered as the best-known destinations for authentic ayurvedic treatments. Thailand is however, well on the way to becoming the next hot spot for Ayurveda. The South-East Asian country is already one of the most popular destinations for cleansing detox treatments. Mangosteen Resort & Spa **** lies in the peaceful, southern area of the holiday island, Phuket. This is one of the first hotels in Thailand to also offer ayurvedic treatments. Lead by Dr. Subash, an Indian ayurvedic doctor, the team of professional spa therapists offer traditional ayurvedic treatments carried out in four treatment rooms. At the start, the ayurvedic doctor determines the dosha of the patient using the famous pulse diagnosis, asking specific questions and assessing physical features, body shape and hair condition. This dosha analysis is the basis of an individual treatment plan for every Ayurveda guest. Every morning begins with gentle yoga exercises, followed by a healthy vegan breakfast. Afterwards, the ayurvedic treatments are carried out in the spa. These include for example; head massages, herbal compresses, rice pouch massages, Sirodhara, oil massages or full-body oil baths. The oils and pastes used for treatments are all imported from India or prepared in-house. An individual, corresponding mix is composed for each guest. The Sattvic board is an important part of the treatment and it is also tailored to the individual needs of the guests. Over time, toxins are dissolved and discharged from the body, which is an important step to a healthy and balanced life. What is the minimum duration of stay? With short stays, the relaxation effects from Ayurveda are the main focus. You can see the first health effects from just 3 days, however for long-lasting results at least a week or two weeks are necessary. 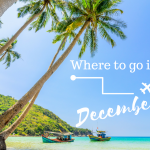 The beautiful landscapes of Thailand with its paradisiacal islands and tropical vegetation make for the perfect setting for a holiday combined with a wellness Ayurveda programme! 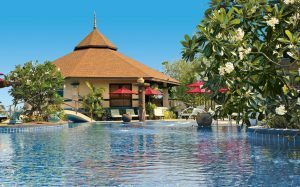 If this article has inspired you, enjoy a rejuvenating Ayurveda programme at the Mangosteen Resort & Spa.